Salmon in the Columbia River Basin have dominated cultural, spiritual and economic influences since the ice age. The largest run of Salmon in the world was abruptly sacrificed when the Grand Coulee Dam was completed in 1942. The recent PBS American Experience documentary described that building the Grand Coulee Dam resulted in “cultural savagery” in its relationship to First Nations and as “environmental butchery” in its relationship to the web of benefits that Salmon gave us. The Grand Coulee completion led to the Columbia River Treaty that formalized water management between the Canada and the USA. When Bill Green, director of the Canadian Columbia River Inter-Tribal Fisheries Commission asked, “What if we could bring the Salmon back within a century of their loss?” the question prompted consideration. Was Salmon loss necessary? Was it forever? 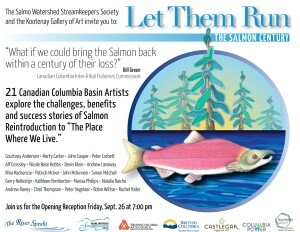 The Salmo Watershed Streamkeepers Society within its The River Speaks awareness campaign reached out to the local Artist community to ask for their help in reimagining Salmon here, in the Canadian Columbia Basin, and more precisely into the home waters of the Salmo[n] Watershed Streamkeepers Society. Artists came together at Hidden Creek on May 8 and 9, 2013, for the Let Them Run, The Salmon Century experiential learning adventure focusing on Water, the Columbia River Treaty, and the challenges, benefits and successes of Salmon reintroduction. 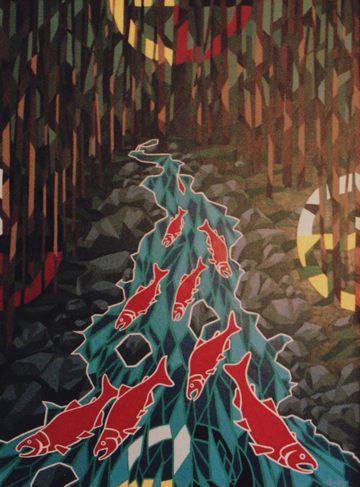 Gaining these insights, Artists were asked to use their skills to create artwork that defines the meaning, challenges and benefits of Salmon reintroduction. 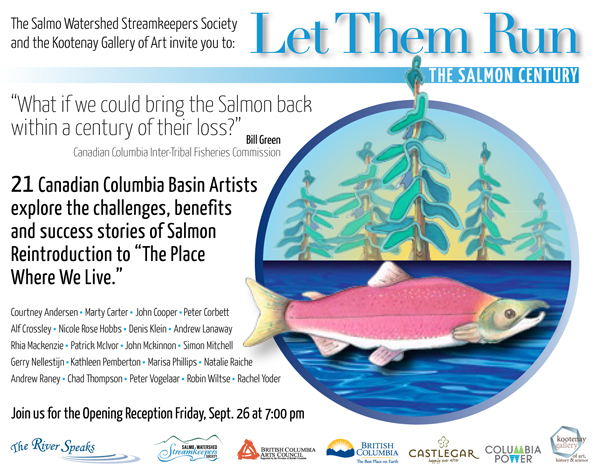 The Let Them Run, The Salmon Century Artist Exhibition opened on BC Rivers Day in September 2014.The public was invited to share in this re-imagining when the Artists presented their creative imagery/movement/sound Exhibition for its first Opening Reception at the Kootenay Gallery of Art, History and Science in Castlegar. BC. 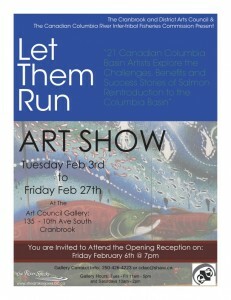 The Exhibition offered viewers the opportunity to gain insights from this Artistic Re-imagining and asked them to advocate for Salmon reintroduction to the Canadian Columbia River Basin. During its 6-week exhibit, public interest was spirited, attendance was high, and the Exhibit received an overwhelming amount of comment. And then the Migration began . . .